This is the 5th GPS logger I’ve checked out, and with one exception, which I will cover in a second, I’m not really seeing anything significantly new here. 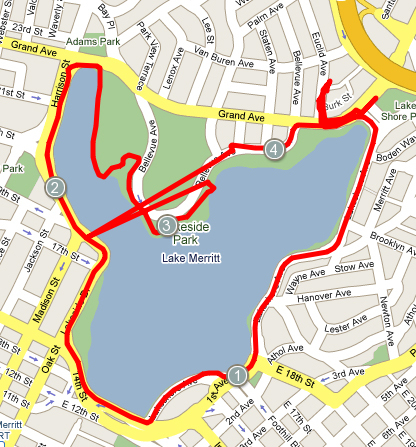 iMapMyRide is a free GPS logger with a companion web site like TrailGuru or Path Tracker. Like these apps, the application takes GPS samples and logs them on the iPhone. After the ride (or run) you can upload these points to a website which will map the information as well as calculate speed and elevation change. 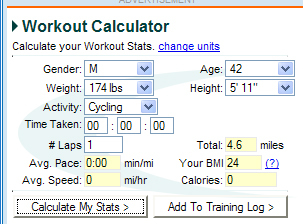 They also have a calorie calculator like Fitnio. A must have for any program in this space is the ability to remove points. I have yet to see a site that does this well. IMapMyRide does not do it all yet (although they say its coming). As you can see in this screenshot, it’s needed. When I clicked on ‘view route’ it did not come up the first time and clicking on ‘view your training’ gives a not loaded URL error. This site is still young, a few bugs here and there, but personally I do not care for it all that much. Too many adverts. I do not mind a few ads here and there, but too many gets in the way. Also, the calorie calculator did not work. Odd. It asks me for the ‘Time Taken’. How should I know? That should be prefilled. I will wait for one more GPS logger then I will go back over all the apps I’ve reviews so far and put a chart together comparing important functions. If there is a free (or .99 cent) app you want me to include, let me know. I will most likely put this together this week. Where to? updated and on sale.